Enjoy country driving of a different kind with a round of golf on a Hills course with a view and perhaps a roo or too. The Adelaide Hills boast a range of golf experiences to suit all golfers, from traditional country and par 3 courses through to private clubs with immaculate championship courses and plush club rooms. What they have in common is bushland surroundings, abundant wildlife and a warm welcome. Keen golfers should make a stop at Sidewood Cellar Door at Maximilian’s Restaurant in Verdun to take the Sidewood Golf Challenge to hit a hole-in-one on the floating golf green to earn a prize. The floating golf green is fifty square metres including artificial turf and a sand bunker and floats on the picturesque lake ninety metres from the tee. For mini golf fun head to Hahndorf where Hahndorf Mini Golf has a putt putt golf course featuring 18 holes with fun and challenging obstacles to put your skills to the test! The Hahndorf Resort also has a course for the use of guests. The Aston Hills Golf Club (formerly Mount Barker - Hahndorf Golf Club) is a friendly Club steeped in history and tradition. The picturesque course is lined with majestic gum trees and is ideal for golfers of all abilities. Measuring 5,614 metres, the 18-hole course has a par 70 rating, offering a comfortable easy walk with gentle undulations, lush fairways and excellent greens. Strategically placed ponds and creeks provide an interesting challenge. The fully licensed Clubhouse is open to the public and offers panoramic views of the course. The club welcomes members and green fee players alike. Blackwood Golf Club is one of Adelaide’s premier courses situated in the stunning foothills, only 30 minutes from the Adelaide CBD. First established in 1930, it is an 18 Hole Par 72 private members club with outstanding facilities. The picturesque course caters for all golfing abilities from the beginner to the professional. Green fee paying visitors are permitted on most days. Echunga Golf Club is located in the beautiful town of Echunga, 5 minutes from Hahndorf and only 30 minutes from the Adelaide CBD. This traditional country club welcomes members and visitors alike, priding itself on its friendly atmosphere, well managed facilities and natural bushland setting. It is a fully watered 18 hole golf course that runs across gently undulating land. The course is a par 70 of 5458 metres for men and a par 71 of 5084 for women offering a challenge to golfers of all abilities with a wide variety of holes. The Highercombe Golf Course was established as a public course in 1968 and has evolved into a scenic and challenging 18 hole, par 70 golf experience over 5,591 meters. The layout features many stands of Poplars, Pines, Eucalypts and other native flora. Several dams on the course provide water for irrigation during the summer months and are the home of a wide variety of bird life. The tree lined fairways provide plenty of variation as they traverse the scenic and undulating rural setting. Kenton Valley Golf Course is a super par 3 course covering 25 acres, with no holes under 100 metres. The course is situated between Gumeracha and Lobethal, only a 20 minute drive from Tea Tree Gully. The course takes around 3 hours to play, and offers a great challenge to the experienced golfer, yet still allows novices to enjoy their golf. A quiet and relaxing place to play a round of golf with family and friends. Only 15 minutes from the centre of Adelaide CBD, Mount Osmond Golf Club is blessed with glorious views of the City of Adelaide, Mt Lofty Ranges and coast line. The excellent course and beautiful heritage clubhouse have been delighting members and visitors since 1927. The wide undulating fairways, challenging greens and stimulating course layout make for a memorable round. 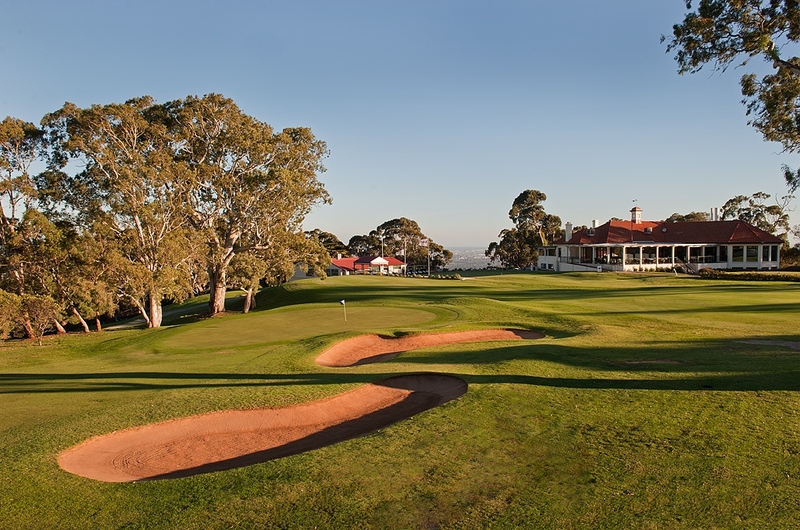 Mount Osmond is a private members Golf Club however visitors are welcome at all times - a great introduction to the city of Adelaide and Adelaide Hills. Nestled in the heart of the Onkaparinga Valley, a comfortable 30 minute drive from Adelaide, Oakbank Golf Club is South Australia’s second oldest, being founded in 1892. The nine hole course is ideal for the recreational golfer; it is easily traversed, has only one sand bunker and is irrigated throughout the summer. The course and clubhouse facilities are available for green fee players and group bookings when the course is not required for Club events. The club has a reputation for being friendly and hospitable. The Stirling Golf Club (formerly Mount Lofty Golf Club) is located in the tranquil and picturesque Piccadilly Valley just 20 minutes from the Adelaide CBD. This club prides itself on welcoming visitors and members from other clubs to enjoy the natural beauty of the course. Cox's Creek meanders through the course, and together with a number of dams and lakes, the water attracts a wide variety of bird life. The deciduous trees look fantastic in autumn, transforming the course into a stunning display of colour.